Find out about the features and benefits of ProvenExpert. 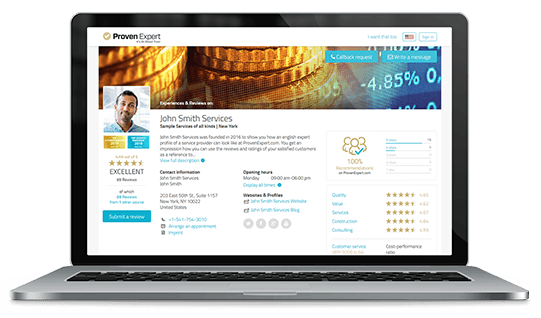 With ProvenExpert, you will collect customer reviews super easily and actively strengthen your online reputation to win new customers. Join more than 65,000 other companies and turn reviews into revenue! We'll show you how easy this can be and how your very own ProvenExpert profile could look like. Simply schedule a free online presentation or request a live demo access to a ProvenExpert account, and we will show you how it's done in no time. Your first step towards more trust, more customers and more revenue. Kick back and let one of our experts show you how ProvenExpert works and how your business can benefit from it - or roll up your sleeves and play around in a demo profile by yourself to see all features in action. Simply let us know how we can reach out to you and what type of introduction you prefer, and we'll be in touch shortly. An error has occurred. We apologize for the inconvenience. Thank you. An email with the access code has been sent to your email address. I know enough. Let me sign up for a free profile! Try our PREMIUM plan for 30 days for free and non-binding, afterwards you will be automatically switched to our FREE plan. Drop us a message - we'll get back to you shortly and will help you with any inquiries.